Everton vs. Chelsea : 14 September 2013. At last the universally despised international break was over and I had my sight set on a Chelsea away day. Over the last few seasons, I have eventually concluded that a trip to Everton’s Goodison Park is my favourite of them all. As increasing numbers of stadia that I grew up with fall by the wayside – The Dell, The Baseball Ground, Highfield Road, Maine Road, The Victoria Ground, Highbury, Ninian Park – or become modernised, and sanitised – Upton Park, Villa Park, White Hart Lane, St. Andrews – there is one old school stadium that defies logic and continues to shine. I have shared my love of Goodison Park on many occasions before, so without going over old ground – no pun intended – I will only say at this stage that Goodison Park, or as the Old Lady as Evertonians refer to it, was dominating my thoughts as the build-up to our first league game in almost three weeks drew nearer. In addition to seeing the boys play – oh, how I have missed them – I would be wallowing in my own particular and personal slice of football history once again. The 5.30pm kick-off allowed me plenty of time to plan my day. The intention was to park-up near the Pier Head, where ferries departed in decades past, and amble around the Albert Dock area. I’ve visited both the Maritime Museum and Tate Liverpool on previous football expeditions to Merseyside; I was hoping for a relaxing pint in a pub or bar overlooking the revamped riverside, rather than the usual pint of fizzy lager in a plastic glass in “The Arkles” opposite Anfield, which is my usual routine for Everton. At just after 10.30am, I was on my way; on the royal blue highway once more. This would be my thirteenth visit to the stadium at the bottom of the gentle slope of Stanley Park. I missed last season’s encounter. In 2011-2012, it was a terrible performance under Villas-Boas. The defeat on the last day of 2010-2011 was remembered for the brutal sacking of Ancelotti. At 11am, I collected Lord Parky. It was a lovely moment – and long overdue. For all of last season, my away trips were solitary affairs. Apart from the pre-season friendly at Brighton and the Community Shield game at Villa Park, the last time Parky accompanied me to a standard away game was in April 2012 at Arsenal. Back in the days when England’s capital city had no European Cup to its name. This would only be my fourth trip the north-west during season 2013-2014. In recent years, the area was very well represented; Premier League regulars Blackburn Rovers, Bolton Wanderers and Wigan Athletic were augmented by single-season stays from Burnley and Blackpool. It seemed that I was heading north on the M6 every month in those days. Now, only the big hitters from Manchester and Liverpool remain. In fact, during this season, there is perhaps the largest spread of cities for decades within the top flight; Swansea and Cardiff to the West, Liverpool and Everton to the North West, Newcastle and Sunderland to the North East, Hull and Norwich to the East and Southampton to the South. We only need Plymouth Argyle and Carlisle United to join us and all extremities within the football landscape will be covered. I backtracked through Bradford-on-Avon, skirted Bath and then headed north. It was brilliant to be back on the road alongside His Lordship once again. However, once on the M4, we were held up for a good thirty minutes as the traffic was reduced to a crawl. After stopping for a coffee at Strensham, and with signs on the M5 warning of even more delays on the M6, I soon realised that our trip down to the banks of The Mersey before the match were probably needing to be curtailed. This was a shame, but there is always next year…and the year after. Instead, the father belted out a song which was completely new to me, and the two sons joined in with gusto. “Oh we hate Bill Shankly and we hate St.John. But most of all we hate big Ron. And we’ll hang those Kopites, one by one, on the banks of the royal blue Mersey. To hell with Liverpool and Rangers too. And we’ll throw them all in the Mersey. I approved. As the drinking continued, we spoke continually about our two favoured teams, buoyed by beer and a mutual dislike of Liverpool. The big moment in the lives of the two sons was the 1995 F.A.Cup win versus the equally despised Manchester United. I sensed a tone of jealousy in their voices when they heard me talk of our recent successes, but I kept telling them – probably to the point of exhaustion – that there really was “no need to be jealous of others. Your team is your team. Relish every goal, every win.” It was a lovely night. One more thing; the father kept referring to me as “Chris, la” which I found to be particularly endearing and authentic. They were good people. After turning off Queens Drive and up Utting Avenue, with the bright stands of Anfield at the top of the hill, I deposited £8 in the hands of a local at the official car park in Stanley Park. It was 3.45pm. The journey north had taken me over five hours. We avoided “Arkles” and headed towards Goodison. Lord Parky soon disappeared inside for a few beers and to his seat in the lower tier of the Bullens Road. With my trusty camera at the ready, I had other ideas. I took a leisurely hour to slowly circumnavigate the four stands of Goodison Park. I was in my element. The sun was out, the sky perfect. The clamour of a match day gave the late afternoon a buzz all of its own. Goodison Park. So, why do I love it? Firstly, the location; surrounded by terraced houses, a proper football locale. Secondly, the history; Everton have played here, since uplifting from Anfield, from 1892. Thirdly, the gargantuan main stand; when I first spotted it in 1986, I could hardly believe its scale, towering over the other three edifices. Next, Archibald Leitch; the venerable stadium architect was responsible for the design and construction of three of the original four stands, two of which – the Gwladys Street and the Bullens Road – remain to this day. The signature Leitch cross-trusses at Goodison, which are still on show on the balcony wall of the Bullens Road, are only present at two other stadia. The others are at Fratton Park and Ibrox. Yep, you’ve guessed – two of my other favourite grounds. Next, my imagination; my late father’s first ever football match took place here at Goodison Park, during the grey years of World War Two while he was stationed on The Wirrall. Lastly, another first game; I took football-mad James, then an eleven year old boy, to his first ever football game at Goodison in 1998. So, yes, Goodison Park ticks a lot of boxes. My tour began behind the new Park Lane stand; constructed in 1994, it is a banal and insipid single-tiered structure which adds nothing to the overall feel to the stadium. I noted that the statue of Dixie Dean had been moved from its original location; maybe it has been moved inside the stadium. Dean was an Everton legend who once amassed a Babe Ruth-like haul of 60 goals in season 1927-1928, and who died, at Goodison, during the 1980 derby. A “fan zone” was in operation behind the Park Lane stand; I avoided it like the plague. I noted a six-piece samba band, dressed in Brazilian yellow and green, parading outside on Goodison Avenue, which was met by blank stares from the locals. It was as incongruous a sight as you will see. I shook my head, tut-tutted and moved on. On Goodison Avenue, my senses were going into overdrive. Unlike at Anfield, Everton have made a conscious effort to spruce up the walls of the stadium’s once grim exterior. Long banners depicting current players adorn the main stand, which now looks bright and welcoming. 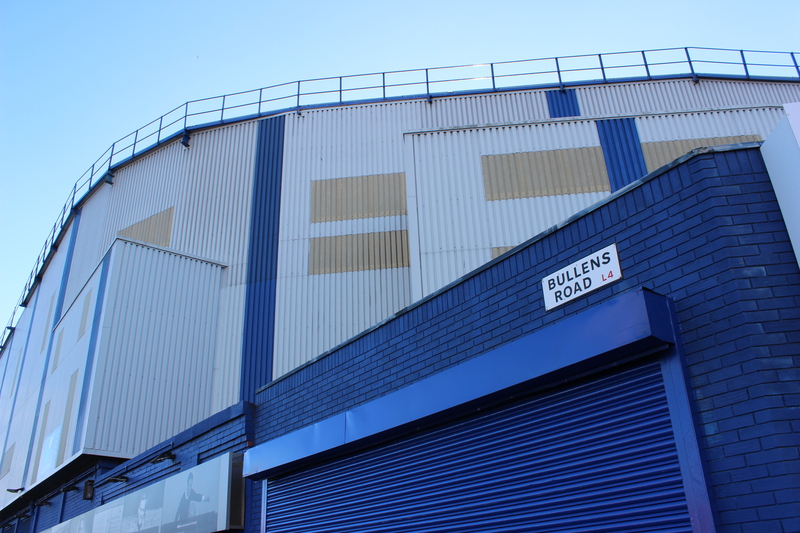 The “Everton timeline” wraps itself around 75% of the current stadium, beginning above the away entrance on the Bullens Road in 1878 and ending on the southern side of the main stand in 2013. It depicts key events, photos of record buys, famous games and Everton trivia. As I found myself walking clockwise around the stadium, I found myself going back in time. Opposite the main stand, towering high, were a couple of basic cafes. One sight saddened me though; The Winslow Hotel, which my father may well have entered around 1942, was boarded-up and empty. The sign depicting Dixie Dean had faded. How sad. I once drank at this pub in 1994, when I parked outside the stands of Goodison before walking up the hill for a Chelsea game at Anfield. There is always something rather spooky about being outside a stadium with no match taking place; the ghosts of thousands of supporters, the silence, the stillness. I once watched a game from the upper tier of the main stand; season 1992-1993, front row, brilliant view, awful retro collars with red laces, Robert Fleck scored, we won 1-0, shortest match review ever. As I took a selection of photographs of the bustling street scene below the vertiginous structure, I noted Romelu Lukaku being driven slowly towards the main reception. At first, the locals were unaware of who the young man in the passenger seat was. Eventually it dawned on them. With the car halted, the window lowered and the Everton loanee kindly signed a few photographs for a few youngsters. I took a few photographs of his smiling face and then seized my moment. I leaned in and shook his hand. I hated to see look of pure desolation on his face after his nervy penalty miss in Prague. I also hated to see some puerile comments on the internet by some Chelsea fans immediately after. Oh boy. The red-brick St. Luke’s church sits right on the junction of Goodison Avenue and Gwladys Street. Back in the ‘eighties, it was still possible to see the whole of this modest place of worship from inside the stadium. It has since been hidden by extra cladding on the Gwladys Street stand and the addition of a large TV screen. Like the cottage at Fulham, it adds to the sense of place that makes Goodison so unique. Still the photographs continued; a turnstile, the angle of two stands joining, a streetside café, Tommy Lawton on the timeline. There is a rather patronising TV advertisement for Barclay’s at the moment; thanking us match-going fans for our continued presence at games. It strongly features a smiling pensioner, possibly photographed at Goodison, certainly wearing Everton blue; his knowing eyes telling a thousand stories, his slight smile indicating past glories and hope for the future. As I walked behind the Bullens Road – getting close to the formidable Chelsea presence outside the away gates now – I spotted his female equivalent. A lady in her ‘eighties – tight perm, blue and white scarf – was being driven in to her personal parking space in a small car park. The sight of this spritely Evertonian made me smile. For those who bemoan the negative aspects of football – the richly-paid players, the out of touch directors, the price of tickets, the occasional presence of racism and loutish behaviour, the commercialisation, the deadening of atmosphere – here was a reminder of what the game means to a lot of people. She must have thousands of great memories from her time supporting her team. I chatted to a few friends outside the away turnstiles. We had heard that Samuel Eto’o was to start. There was confused talk of how Lukaku had been loaned out – again – when most of us supporters would have preferred to see him in Chelsea blue throughout this season. I guess we will never know the full story of the club’s decision to keep Torres and Ba, though I presume that the former’s wage demands have played a part in possible thoughts of moving him on. At least Juan Mata was starting. I looked up and spotted Burger, the erstwhile Toronto native now transplanted into the heart of England. He quickly introduced me to his father – his first visit to these shores, his first football match, his first Chelsea match. I repeated my father’s story about Everton and he smiled. Burger Junior and Burger Senior had been drinking, with Cathy and others, since 10am and I was impressed. I wished them well and hurriedly took my place alongside Alan, Gary and 1,500 others in the Bullens Road upper tier. There were a similar number down below us. The Farm’s “All Together Now” was on the PA as I scanned the scene around me. Goodison’s capacity is 40,000 now and I spotted a few empty seats, namely those behind the roof supports in the Gwladys Street. Another Goodison favourite – “Z Cars” – was played as the teams entered. Chelsea were in black once more. Cech – Brana, JT, Luiz, Ash – Mikel, Rambo – Mata, Schurrle, Hazard – Eto’o. The game began brightly enough. Ramires was full of energy and we dominated the early few minutes. All eyes were on our new striker though; as he moved around the pitch, my mind played tricks on me. I imagined Eto’o to be taller. He seemed willing, but his first few efforts were poor. One header over with Tim Howard untested and another which ballooned into the top tier. At least he was getting in to position. Gary, standing alongside me and already “venting,” made me chuckle with his pronunciation of our new striker’s surname. Only a Londoner could attempt to pronounce Eto’o without sounding the letter T.
The best chance of the first-half came when Howard fluffed a clearance and Andrea Schurrle pounced. He played the ball into the path of the advancing Eto’o and the 3,000 Chelsea away fans inhaled a breath of expectation. Out of nowhere, a leg from an Everton player – Gareth Barry – blocked the shot. We were in disbelief. Our support was OK. The home fans, though, resorted to type and hardly spoke, let alone sang. Everton rarely threatened; Naismith shot wide, but chances were rare down below us. At the other end, Mikel and Schurrle shot over. Our chances were being squandered and the away support grew frustrated. During the closing minutes of the first-half, Everton turned the screw. During one attack, two Everton players were completely unmarked at the far post and we were lucky to escape unpunished. Right on half-time, sloppy defending allowed a cross to be headed back across the goal by Jelavic to allow Naismith to leap unhindered and nod home from a yard out. At half-time, I chatted briefly to Tim from Dublin. Straight after the whistle, Andrea Schurrle was played in and inexplicably missed from an angle. It took me a few, puzzling seconds to realise that he hadn’t scored. Eto’o lunged at a cross and failed to make contact. At least he was getting into the right positions. Right? 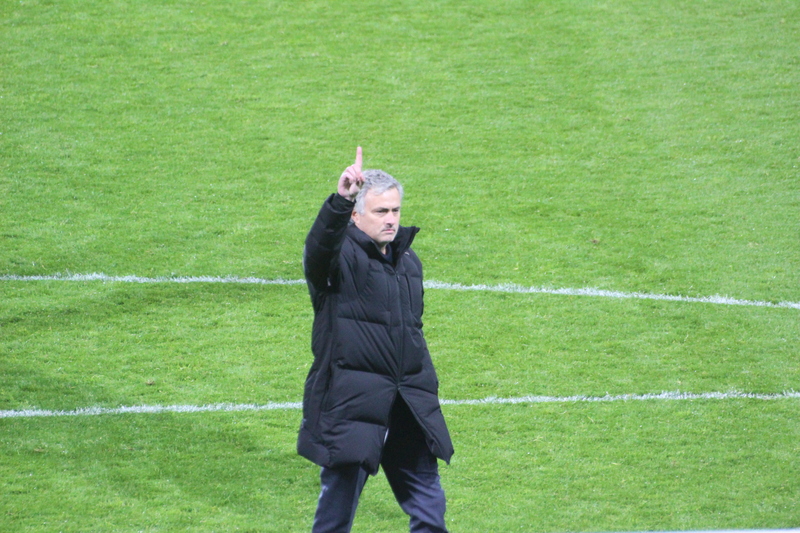 Jose Mourinho then surprised us all and made a double substitution, taking off Mata and Schurrle. On came Oscar and Frank Lampard. In truth, neither player produced in the remainder of the match. A Ramires toe-poke went wide. The general consensus was that we wouldn’t score even if the game continued until November. In reality, such was our mood, we expected Everton to increase their lead on their rare forays into our half. Luiz was lucky to stay on after a tangle on the half-way line. We were riding our luck. Then, the last throw of the dice; Ashley Cole off, Torres on, three at the back, but with Mikel playing very deep alongside Lamps. Where other players were faltering, Mikel was having a great game…reading attacks, breaking-up play, turning, playing it simple. Top marks. Two last chances summed our day up. Firstly, an attempted flick from Eto’o from close in, but he missed the ball completely. Secondly, a poor shot from Torres’ weak left foot which looked as ugly as it gets and meekly spun off for a goal-kick. Thankfully, Leighton Baines clipped the junction of post and bar at the other end from a free-kick on ninety minutes. Although it was a far from adequate performance – too many personal errors – we barely deserved to lose. At the final whistle, we shuffled out as the Evertonians – at last – made some noise. I glanced at Tim, but his face was disconsolate. No words were needed. I glowered back. On the walk back to the car, Parky and I caught up with Chopper, Jokka, Neil and Jonesy. There were a few mumbles and grumbles and this was to be expected. However, it was a difficult game to summarise. Everton weren’t that great. They did enough. If our players had played 10% better – maybe just 5% better – we would have won 3-0. Our play suffered with just too many silly errors at key times. I spoke with Jokka and offered some home-spun philosophy. On Wednesday, we have the chance to make amends when our European campaign kicks off. MLS All-Stars vs. Chelsea : 25 July 2012. It was game day in Philadelphia. The Chelsea faithful had traveled down by buses, trains and automobiles from New York and were awaiting the third game of the US 2012 Tour. After the rather average performance by the team against Paris St. Germain, we were all hoping for a better showing against the MLS team in the All-Star game in nearby Chester, a small town to the south, which plays host to the Philadelphia Union team. All of us were adamant that the patchy support at Yankee Stadium would be trumped by some loud and loyal singing from the cramped corner segment of PPL Park, too. In this scenario, less would definitely be more. There would be more passionate fans in a tighter area. It just had to be a winner. It was a theme that resounded throughout meetings with fellow fans in Philly. However, NYC was still on my mind; my troubled mind. Personally, I was still trying to get to grips with what I had witnessed in NYC. I had seen Chelsea play in Yankee Stadium and yet I was somewhat unsure of the whole experience. To be truthful – and I always knew this – I was still missing old Yankee Stadium. Sure, the record books will show that Chelsea played at the shining new edifice in the South Bronx, but deep down I was struggling to rationalise the reasons why I felt it was so odd to be a spectator in the new place. I guess the facts speak for themselves. Between May 1990 and June 2008, I had seen 23 Yankee games in old Yankee stadium. Those memories will never be erased. The Mattingly home run in my first-ever game, a couple of magnificent wins against Boston, the first ever Yankees vs. Mets series in 1997, a David Cone master class, a Jorge Posada grand slam…Paul O’Neil, Wade Boggs, Bernie Williams, Tino Martinez…Derek Jeter…Mariano Rivera. I am so grateful that I chose the Yankees as my team because I truly felt at home in the tight passageways beneath the towering upper deck of that historic ballpark on River Avenue. The place will always be with me. I guess it was typical New York; grimy, claustrophic, rowdy, monumental. The new stadium just doesn’t thrill me in the same way. So, there was all that floating around inside my addled head. For a day or so, I was also rueing the fact that I never really had the chance to say a proper farewell to Roma, Vanessa and Shawn. The plan was for them to meet us down at Legends after the game, but they got caught behind some horrendous traffic and so decided to head up to Roma’s brother’s house in Massachusetts instead as time was moving on. There would be no hugs for them all. It left me a little sad. However, after the adrenalin-filled action of NYC, Philadelphia was proving to be much more relaxing. The four of us were certainly enjoying our fantastic apartment right on Benjamin Franklin Parkway. From our balcony, we could see the Rocky Steps to our left and the City Hall to our right. The apartment was so big that we had to text each other to communicate. The bedroom had a different zip code to the kitchen. The rooftop pool was a fantastic extra. Philadelphia was superb. This was my fifth visit to the City of Brotherly Love and I joked that it was “typical Chelsea” that I keep getting pulled back to the same cities in the US as the team does during European competitions; how many times have we visited Porto, Valencia, Rome and Marseille? Although I would class NYC as my favourite US city, Philly is rapidly becoming a bit of an obsession. I mentioned to a few Chelsea fans that my great great grandparents lived in the city in the middle of the nineteenth century – after getting shipwrecked off the coast of Newfoundland – before returning back to England. My great grandmother was born in England, but at least one of her siblings was born in America. My personal knowledge of this slice of my past is rather sketchy, but my mother always wanted to visit Philadelphia on the back of this story. So, in 2010, my mother and I spent a very memorable week in the city. It is a week I will never forget. On several occasions, I trembled when I realised that Benjamin and Barbara White may have walked the same steps in the 1850’s. In 2012, Philly was treating me well. On the Monday, Captain Jack had taken a half-day off work to show a few of us around his adopted city; it was a marvellous walk through a few blocks of the historic centre, ending up with a cheese steak at the legendary “Jim’s” on South Street. This was followed by an equally wonderful visit to see the Phillies defeat Milwaukee 7-6. The others were feeling tired and headed home when the home team were 6-3 down, but I stayed the course and was rewarded with four runs in the bottom of the ninth. This was my fourth Philly game in the city and although the Yanks are my team, I did let my mind wander a little and wonder if I should really have chosen the red of Philly over the navy of the Bronx in lieu of my own personal history. Nah, what am I thinking? Everyone knows that Randolph Axon once lived in a little tenement off Grand Concourse in the Bronx in the first few years of the last century. On the Tuesday – a really lazy day – we were lucky enough to meet some of the players as they boarded the coach for a practice session outside the Ritz-Carlton Hotel, overlooking the City Hall. Our good fortune in meeting the players reminded me so much of my time in Chicago in 2006. I still rate this as my favourite CFC trip to the US, despite our 1-0 defeat and despite it being the only game of the trip. It was, quite simply, a perfect few days in the Windy City. On the very first night, myself, Roma – plus her daughters Vanessa and Jenny – and my mate Chris met virtually all the Chelsea players outside the team hotel, no more than 300 yards from our hotel just off Magnificent Mile. On this trip, however, I became more integrated with the fans from America. During my two previous trips – 2004 in Pittsburgh, in 2005 in DC and NYC – we mainly kept to ourselves. In 2006, though, the floodgates opened and I was lucky enough to meet many US-based fans. Since then, my Chelsea life has taken a wonderful – unplanned – route all of its own. After spending a few hours in “Tir Na Nog” on the Tuesday evening – nice and easy, meeting a few new Chelsea fans – we retired to the pub which was part of the same building as our apartment. We were relaxing outside on the pavement, having a bite to eat, supping some ales, when a taxi cab pulled up outside the bar. A chap exited the cab with a couple of friends and I immediately remembered him from a post-baseball game pint the previous night. I had remarked that he was a doppelganger for Carlo Ancelotti. On this occasion, we couldn’t let the moment pass. King Carlo Has Won The Double. And The 5hit From The Lane. Have Won Fcuk All Again. We were roaring with laughter and “Carlo” approached us with an increasingly bemused look on his face. I explained to him about his uncanny resemblance to Carlo and guess what? He was a Scouser. To be fair to him, he took it all in great spirits and even posed for photographs with us. He said he had been mistaken for Jay Leno the previous night. As one, all of our left eyebrows arched in disbelief. By the way, the look on the faces of the other customers at the tables was priceless. We were still laughing about this incident when we arose from our slumber on the Wednesday. 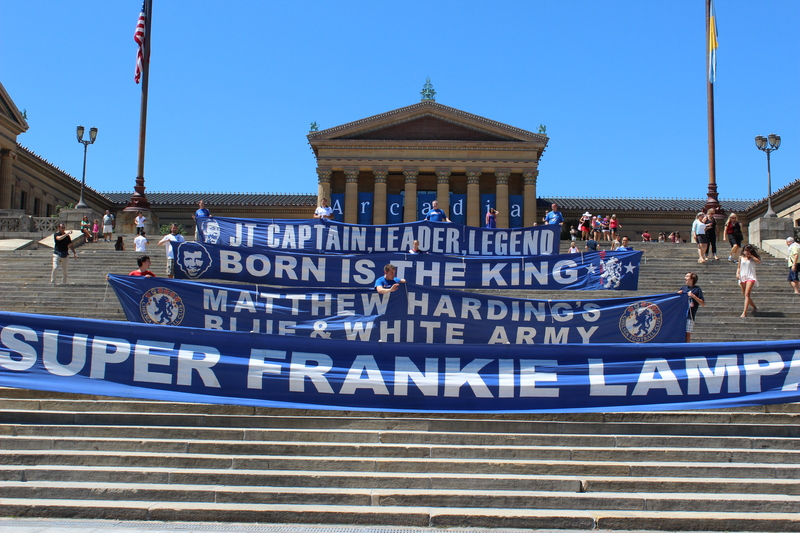 We had no real plans for the day, but I soon received a text from Steve Mantle about walking over to the Rocky Steps with the four official Chelsea banners in order for photographs to be taken. Now, that sounded like a magnificent idea. Despite the sun bearing down on us, we assembled at Tir Na Nog and set off. I had previously run up the steps at the Philadelphia Museum of Art in 2008 – it is surely the most important thing that anyone must do in Philadelphia – and so I knew what to expect. The steps were perfect for a photograph. I stood at the base and conducted the proceedings. We elicited the assistance of a few willing tourists and I shouted instructions from below. With everyone in place, I snapped away like a fool, knowing full well that Chelsea would be using some of the photographs in an upcoming magazine or programme. We created a bit of a scene to be honest and I guess it is the nearest I’ll ever get to being part of a flash mob. We engaged in conversations with a few fellow fans and met a young lad wearing a Frank Lampard shirt who would be taking part in the on-game ceremonies later that day at the game. In truth, the twenty minutes we spent under the baking sun at the Rocky Steps were one of the highlights of the whole trip. I changed into my 1989 Chelsea shirt and met up with the Chelsea faithful in Tir Na Nog at just after 5pm. Amongst the mass of blue, I was very pleased to be able to meet Captain Jack’s family; his wife Teri and their three lovely daughters called in to say “hi” and I was able to start the slow but thorough dialogue with Teri which will eventually lead to Captain Jack being allowed across the ocean to see Chelsea play at The Bridge. In fact, there is a humorous sub story here. Teri once lived in South Kensington for a short amount of time – way back when Chelsea were mere mortals – and has actually stepped foot inside Stamford Bridge. Come on Teri – let Steve at least even the score. I then did a very silly thing. I did a “Zigger Zagger” and scared the three girls to death. I had a very quick word with Frank Sinclair and I thanked him for his kind comments about my performance on the five-a-side pitch in New York. He seemed to be enjoying himself on the tour. I can pay him no bigger a compliment than this; when we used to call in on Ron Harris in the ‘nineties, Frank was always a player who Ron rated. Frank was maybe not the most skilful, but a player who always tried his hardest. A player of guts and determination. As I wandered around the pub, bumping into a few old friends – and a few new ones – I noticed some Chelsea fans not joining in with the songs. I secretly tut-tutted to myself and hoped for solidarity later on that evening. It would be no time for shyness or indifference. At 6pm, we were told to board the fleet of four yellow school buses which had assembled in the little side street outside the pub. Another surreal experience, another typically American moment, another memory for me to take away with me. How quintessentially American. How hugely untypically Chelsea. The sight of us piling into the yellow vehicles still brings a smile to my face. We were allowed to drink beer on the 45 minute journey to PPL Park. As the four buses roared along I-95, and then got caught in commuter traffic, and then raced each other, with fans gesticulating wildly at each other, with the skyscrapers of downtown Philadelphia in the background, it was a wonderful moment. Why can’t all Chelsea away games be like this, full of excited fans, smiling faces, with none of the surliness shown by sections of our usual support? The beer was going down well and the songs were roaring. We had two Seattle Sounders fans on our bus and they led the way; others followed. Speedy was in good form and I followed with a few old favourites. There is nothing like a beer to keep your throat well-oiled. I chatted to a few new faces and thoroughly enjoyed myself. In fact, I didn’t really want the journey to end. We were eventually dropped off way past the stadium. Beth was far from pleased and I could understand her displeasure. Out in the bright evening sun, I soon chanced upon a few familiar faces that were having a little all-American tailgate. Beers were handed out and we even had a little kick-about. Tim from Philly, Mike from New York, Matthew from New York wearing a vintage NASL Memphis Rogues T-shirt. At the baseball game on the Monday, I had chosen to wear a Philadelphia Fury shirt in honour of the great Peter Osgood who played for them during the summer of 1978. The time was moving on. Away in the distance, the stadium looked a picture. Beyond, the Commodore Barry Bridge – again, so typically American – was proving to be just as magnificent. By this time, my head was buzzing, but I knew I had to get inside the stadium in order to get a share of some the pre-match atmosphere. I was also concerned about getting a fair share of photographs. I began the long walk to PPL Park, with the sun just starting to set to the west. By now, I had lost contact with everyone and was – ahem – walking alone. At the pub, I had met a Chelsea fan who was wearing a bona fide shirt from 1991 – Commodore – and I met another one just outside the stadium. I had a little banter with a few Union fans; friendly, in the main. I did wonder, though, why so many fans were wearing scarves. It seems that the US “soccer” fan base has clearly decided that a scarf is the de facto mark of football subculture, whereas – in reality – very few regulars wear scarves at Chelsea. I bumped into Kev outside. Kev sits no more than eight seats away from me at Chelsea and we have been keeping each other updated with stories and rumours of this 2012 tour for what seems like an eternity. Now, we were both there in the flesh. I was amongst friends in the Chelsea section at PPL Park. We were positioned at the top of the terrace. A few yards to my right were Funchficker and Mrs. Funchficker, Lottinho, The Bobster, Captain Jack and Speedy. Alongside me was Rey, from Los Angeles, and I was so pleased to see him again. Behind – a real surprise – was Mike Dutter and I haven’t seen him for ages. Phil was there with the Iowa Blues. Beyond – the OC Hoolifans, Mike Price at only his second ever Chelsea game, the Boston Boys…everyone together, everyone well-oiled and up for it. In front, Mark Coden – like me, an ever present on all of these recent Chelsea tours to the US. The game against the MLS All-Stars would be my eleventh such game. I had taken several photographs of the bridge on my approach to the 19,000 capacity stadium but was rather annoyed that its iconic steelwork was out of sight, just beyond the stand to my left. I had admired the way that the roof of this stand seemed to extend out to the bridge. Above, the sky was slowly turning a deep blue. The moon was strikingly clear above the stand to my right. The Chelsea fans around me were standing. And we were clearly in good voice. The spectators were urged to take part in a two-part “stunt” but I had neither the time nor the energy for it. I believe the words “Chelsea” were visible on cards held aloft by the fans in the stand to my right, but the moment was lost to be honest. Secondly, the colours of the American flag were visible. The entrance of the teams. My head was still buzzing and I still needed to concentrate on getting some photographs. The game against the MLS All-Stars in Chester, Pennsylvania will be remembered by those Chelsea fans present not for the performance of the players, nor the result, but for the constant singing, chanting and commotion created by the 1,200 fans present. We stood the entire game and we sung the entire game. Steve-O set the tone early on with a trademark “Zigger Zagger” and the chanting continued throughout the match. This was just what we had hoped; that the closeness of everyone would produce a subsection of PPL Park akin to an away terrace at Blackburn, Everton, West Ham or Tottenham. I liked that. A little jab at the MLS hierarchy. Keep ‘em on their toes. All the Chelsea classics were aired; too numerous to mention. I’m sure everyone has their own particular favourites. Halfway through the first-half, I absolutely loved the roll-call which was started by the usual suspects to my right. Out on the pitch, I will admit to being thrilled to see David Beckham play one last time, way out on the right in a rather withdrawn position. I have a lovely shot of him joking with John Terry. The MLS team went a goal up through a Wondolowski effort from close in, only for John Terry to rise high and head home from a corner. At the break, I rushed down to buy a beer, a hot dog and a match programme. The beer did its job because soon into the second half, I let rip with another “Zigger Zagger.” I was elated to hear the thunderous response to each guttural yelp. However, I knew I was reaching the end of my capabilities when I reached the closing moments. A nice tap in from Frank Lampard gave us a 2-1 lead, but – much to our annoyance and disbelief – the MLS team not only equalised through Pontius but scored the winner in the “nth” minute of extra time with a ridiculous looped shot from Eddie Johnson which ricocheted off David Luiz’ leg and into an empty goal with Ross Turnbull beaten. We were not deflated, though. We kept singing till the end. It was a proud night in Pennsylvania. It was a quiet bus ride back to Philly. Throughout the evening, Roma’s daughter Vanessa had texted me a few times to see what time we would be getting back into town. It seemed that they were halting their long drive back to North Carolina especially to call in to see me in Philadelphia. I gave them instructions of how to reach Tir Na Nog, but I wasn’t sure if they could delay their drive home for long. I quickly darted back to the apartment to drop off a few things and made my way to the pub. I was in mid-text to Vanessa when I looked up to see the three of them walking towards me. Ah, that cheered me up no end. They, of course, were horrified to hear that Chelsea had lost. We returned to Tir Na Nog and met up with the usual suspects once more. The mood among my Chelsea mates was defiant. We all agreed that the singing and the atmosphere amongst the “away” fans had been magnificent. I was certainly full of praise, if not full of voice. My words had obviously impressed him. I waved them off as Vanessa drove away into the night. Back in the apartment, Lottinho, Speedy and I spent a few philosophical moments as we looked out into the city from our balcony. It had been a simply superb time and we had enjoyed ourselves immensely in Philadelphia. 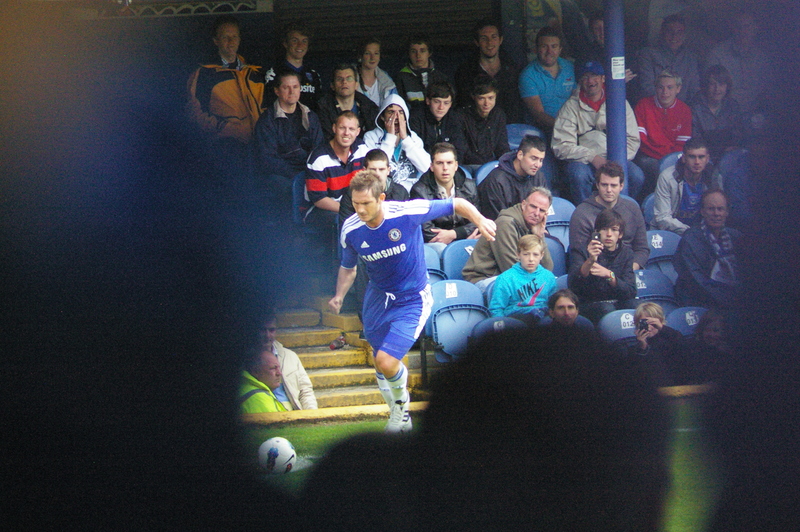 Portsmouth vs. Chelsea : 16 July 2011. Just eight weeks have passed since the last Chelsea game: that dour, depressing and unrewarding performance at Goodison Park which was immediately followed by the hurtful sacking of Carlo Ancelotti, just hours after the final whistle. It was a sad end to a frustrating season for us and the treatment of Carlo by the club certainly left a sour taste in my mouth for some time after. Since then, I have been on a self-titled “Chelsea Detox.” I have been laying low, keeping still and quiet, calming myself, re-energising for the trials and tribulations for the highs and lows of the new season ahead. If it is at all possible, I’ve been trying not to think too much about football and Chelsea in particular. This way of life so devours me during the season itself that I really do need this two month break from it all. Of course, the internet – the damn internet – does not help. Various sites have been full of various scurrilous and wayward rumours about certain players with whom Chelsea are allegedly linked. Over the summer, I realised that I have grown tired of all this. The last time I was genuinely elated about a Chelsea signing was in the Gullit, Vialli and Zola years. Since then, without sounding too blasé, I’ve seen them come and I’ve seen them go. The managers too. Hoddle, Gullit, Vialli, Ranieri, Mourinho, Grant, Scolari, Hiddink, Ancelotti…and now the new guy Andre Villas-Boas. Seen ‘em come. Seen ‘em go. Welcome to the club Andre. I wish you well. This is a mantra I have been preaching too. As the years pass, the football almost becomes irrelevant. I have even said that my Chelsea goes from pre-match drinking session to the next, rather than game to game. The games in between the sessions give us something to talk about, but the drinking and socialising is the crux of all this. When the football wasn’t so great (let’s say 1991-1992 for example, though there have been others…), the pre-match meet-ups were what kept me coming back to Chelsea season after season. …and you will hear variations of this ethos throughout my many various match reports during the coming year ahead. I guess you all had best get used to it. Wink. The constant drone of 24/7 football overkill with salacious rumours and gossip seem to be the norm these days, but I remember times when the summer was a more restful time. When I was younger, my family and I used to get daily newspapers and there used to be a reduction in football news from the end of May through to the start of July. The sporting sections of papers would be full of Test Match cricket, Wimbledon and golf and, at times, football might only warrant a few scant paragraphs. Those days seem a lifetime away to me now. I remember the summer of 1983 in particular. I remember being in Frome on a Friday afternoon, the day before I was due to travel up by train for the league opener with Derby County at The Bridge. In those days, virtually the only football magazines that were on offer were the ones aimed at early teens…”Shoot” and “Match Weekly.” I had been getting “Shoot” since I was seven and I was now eighteen. And I was probably embarrassed to buy it, but it was always good for mail order products like football programmes and replica kits. Anyway, on this particular afternoon, I remember buying a “Match Weekly” and not only seeing our new Le Coq Sportif shirt for the first time, but also reading, with increasing disbelief, that we had recently purchased Kerry Dixon, Pat Nevin, Joe McLaughlin, Nigel Spackman, Eddie Niedzwiecki, John Hollins and Alan Hudson. Not only was I excited and amazed, but I was also dumbfounded that these signings had passed me by. I can only surmise that we had stopped getting daily ‘papers that summer as we sometimes couldn’t afford them, if the truth be known. Living in the south-west, without access to the London TV and national press, I guess I was out of the loop. Also, Chelsea were a struggling Second Division Two team at the time. Maybe we just weren’t newsworthy enough for these signings to reach me in deepest Somerset. So – imagine that. A Chelsea fanatic like myself not knowing we had bought “The Magnificent Seven” during the summer of 1983. It’s hard to fathom, isn’t it? I set off for Fratton Park at 11.30am and Parky, my travelling companion for 75% of my Chelsea trips, was alongside me once again. I haven’t seen too much of him in that eight week period, so we spent quite a while updating each other on all of the gossip. A sizeable segment of the first hour was spent running through my travel plans for the Asia tour and how I wish Parky and a few more friends could accompany me. I’m such a lucky so-and-so to be off on my travels once again. Other topics were discussed and news of mutual friends exchanged. The tickets for the game at Portsmouth were just £15 and we wondered how many tickets were sold. I guess we expected a full Chelsea allocation of around 3,000 in an attendance of around 15,000. I went to a pre-season game at Fratton once before, in 2002, and sat in the rickety old Leitch stand above the half-way line. It was a great view to be fair. Everyone knows how much I love my stadia architecture and I have a definite soft-spot for raggedy-arsed Fratton. I get quite depressed when fellow Chelsea fans lambast it. I for one will miss it when it is redeveloped or bulldozed and Pompey play in a sterile bowl on the city boundaries. The traffic was horrendous as we passed through the quaint Wiltshire city of Salisbury and this held us up. The weather forecast was for rain, rain and more rain. At least there is a roof on the away terrace at Fratton these days. Eventually, we left the cathedral city of Salisbury behind and ploughed on, eventually parking up outside the Good Companion pub at 2pm. Time moves fast in Chelsea World. I bought His Lordship a pint and a Coke for myself. My alcohol intake over the summer has reduced to just a trickle and I am wondering how I’ll cope once I get on the beers in Kuala Lumpur and Bangok. Things could get a little messy. I had a good old chat with Rob and then Burger and Julie, who had decided to book the night in a city centre hotel. At 2.45pm, we left the now empty pub and walked the short distance to Fratton. This was a first-time visit for Burger and Julie and I acknowledged their gasps of astonishment at the down-at-heel entrance to the away stand. Ironically, my PFC-supporting mate Rick was visiting his parents in Frome and there is a fair chance that we may have passed each other on the A36. Parky and myself had tickets in the very back row of section M. We reached our seats just as the teams entered the pitch. We have that “Drinking + Walking + Admission” equation worked out perfectly these days. Ah, the first game back. A quick scan around. Paolo the captain, looking more tanned than usual. Torres with his Liverpool-style haircut and Alice band. Chelsea in blue, Pompey in a new black away kit. I only had the pleasure of seeing our new away kit once during the entire time at Fratton. And, frankly, that was once too many. It was on a 50-something year old bloke and it looked awful. I saw a few Chelsea home shirts, but the crowd in that packed Milton End mainly wore that usual eclectic mix of English football threads. Parky and I, overlooking the rear walkway, noted a few nice tops. And it was – a subtle yellow with deep orange trim. Good work. It dawned on me that this song was sung so quickly in order to fill the void of where a song for Andre Villas-Boas should be. Still haven’t mastered his name, still haven’t mustered a song…but we are working on it. Then, a crazy period of football and support, intertwined. A fan had evidently smuggled in some bags of celery, right down below us, and frantically pelted it everywhere…it was the biggest show of celery at an away game for years and it was a joy to behold. We pelted some stewards and someone managed to hit a female steward, who picked the celery up and threw it back. It was a great piece of comedy. Many pieces of the yellowy-green vegetable had made their way onto the pitch. With that, a young lad did a hearty Zigger Zagger and we all joined in. I had trouble concentrating on the game as the support in our section was boiling over. However, the ball was played out to Fernando Torres out on the Chelsea right. I spotted Studge making a run into the middle, but the ensuing cross was nimbly headed into his own net by a Portsmouth defender. I’ll be honest – I think Parky was too busy filming the celery and missed it. Amidst the laughter caused by the celery flying in every direction, now laughter at an own goal. It was a great moment. The sun eventually broke out from behind the clouds and it was becoming a pleasant, though blustery, afternoon. The Chelsea songs continued throughout the first half, even when Pompey had a little spell of possession just after the half-hour mark. At half-time, the management team decided to hold the half-time preparations on the pitch and out came my camera to record the shuttle runs, the tactical talks and the fans serenading the substitutes – especially JT, Frank, Drogba and Nico. Songs for each of them. It was a lovely period, actually. I wondered if we would see some of the players in a Chelsea shirt ever again in the UK…Anelka must be a favourite to move on, I would guess. Andre Villas-Boas is a slight figure and he quietly spoke to a few players in turn. Di Matteo, however, was in control of a folder which he flicked through with various players. Lots of chat, lots of gestures. The players looked attentive and primed. The play on the pitch wasn’t fantastic, but what do people expect? We had a lot of the ball, but found it difficult to work openings. A delightful Josh turn here, a lovely Kalou dribble there, a run from Drogba, neat control from Anelka…but not much threat. To be honest, it was Hilario’s half. He scythed down a Pompey attacker, but then threw himself to his left to save the resultant penalty. We then endured two almost identical pieces of horrendous defending caused by Hilario’s poor communication with his defenders. How we never conceded goals on each of those occasions, I will never know. Only a piece of super-human defending from JT on the second instance kept our goal intact. No more goals ensued and the final whistle was met with a half-hearted cheer from us in the packed Milton End. It hadn’t been a great game, but so what? Today was all about showing up in our thousands – which we did – meeting up with friends – which we did – out singing the home fans – which we did – throwing celery at everyone – which we did – and showing some love to our players – which we did. Anything else, surely, would have been a bonus. We quickly galloped back to the car and I made great time heading north up the A36. The music kept us buoyant – Joe Jackson, Tom Robinson, The Skids, The Undertones, The Pretenders and The Members – and I dropped Parky off at just before 7pm. With a four week gap now, until the home opener, it will be a while before I see him again. I’m on the edge of the biggest leap yet in support of my team and my club, with a flight to Kuala Lumpur just 14 hours away. I think it’s time to reflect for a moment on what Chelsea Football Club has become. The loveable old under-achievers of my youth, supported by rapscallions and hooligans, celebrities and eccentrics, working class lads from inner London and die-hards all over the UK, have evolved into a 21st Century footballing powerhouse of national and international prominence. It gives me a moment in time for me to hold a mirror up and comment on what I see. To paraphrase my old geography lecturer at North Staffs Poly : Who is Chelsea? What is Chelsea? Where is Chelsea? Why is Chelsea? And what of it? This trip out East might aid me in answering these questions. Apart from the football – see my earlier comments – this trip is going to give me a great opportunity to appreciate how other nationalities perceive us and for me to try to get to grips with what being a member of the Chelsea Family means to the good people of Malaysia and Thailand. I’m particularly anxious to hopefully dispel some myths about our overseas support. There is a growing and tedious trend at Chelsea – or at least amongst the less enlightened members of some chat forums – to think that foreign fans have no right to support Chelsea. That they are all JCLs. That you have to go to 50 Chelsea games a season to be a true fan. Well, I already know from my travels in the USA that this view is way off the mark. So, as is the case with a lot of the games that I have witnessed in America, whereas others will be watching the action on the pitch, I might well be centering my gaze on the supporters and fans off it. To say I am excited would be a ridiculous understatement. Now, where did I put that celery? Chelsea vs. FC Copenhagen : 16 March 2011. Ah, the 16th of March – a momentous date in my life. Our game with Copenhagen coincided with the 37th anniversary of my first ever Chelsea game. Ironically, our defeat at the hands of Inter last season was on the same date – but I was pretty confident that a similar fate would not befall Chelsea in 2011. In fact, I had hardly thought about the game against Gronkjaer and co – yet another game that had snuck in under the radar. I took a half day holiday as I had just about had my fill of stressful sorties up the M4 motorway for midweek games. As it happened, this was a very fortuitous move. At around 4pm, with His Lordship alongside me, I received a text from Bristol Tim on the M4. It seemed that there had been a major snarl-up around Maidenhead and that the eastbound motorway would be closed until 6.15pm. I contemplated my options and took the A34 down to the A303 and headed in on the M3. From my home in Somerset, I had headed north to collect Parky, then east towards Hungerford, north to the M4, east towards Newbury, and then I took that well-timed diversion south to the A303, then east again to the M25 and eventually north to the M4 and then finally east towards HQ. My route to Stamford Bridge had mirrored an elongated Pat Nevin dribble. A bit like that famous one against The Geordies in 1983, maybe. With much pleasure, we stumbled into The Goose at 5.45pm – my journey had grown to 141 miles, but I could relax. Tim, however, was still struggling to get in and was still stuck on the M4. We spent a lovely 90 minutes in the pub, chatting and looking forward to possible venues for “the last eight.” One of our topics of conversation – and consternation – was the price of the game…my ticket had cost me £57. That’s a lot of money for a tie which, hopefully, was already won in Denmark. But what can we do? Maybe one day, I’ll resist. To be fair, Rob had looked at the price and had resisted. However, he made it in from Essex for the pre-match banter (which is what 75% of “Chelsea” is anyway, let’s be honest) and then had plans to disappear off to The Imperial to watch the game on the box. I respected his opinion – he had paid ?50 to fly to Copenhagen for the first leg, but had really felt disgusted about paying more for his own seat at The Bridge. I was left with explicit instructions for me to text him my guestimate of the crowd. In our little corner, surrounded by familiar faces, it was a typical scene. Smiles and laughter, groans at shocking puns, pints of Carling, mobile phones being checked for messages, friends arriving, faces noted, talk of past games, the Blackpool post-game party and the inevitable hangovers, Barbour jackets, pints of Fosters, new pullovers, shrieks from the far corner, friends from far off places, the excitement of the imminent draw, “get the beers in Parky”, more tales from Blackpool, plans for Stoke away, Russell’s new job, “mind yer backs”, more beers, blokes in work clothes, shared memories of distant fashions and distant games, Bayern Munich away, Juventus two years ago, the classic moments relived one more time, lads in Adidas trainers, “one more beer”, tangled conversations, jokes, banter, football. Inside the stadium, it soon became apparent that fewer people than we had expected had resisted the game. All areas, with the exception of the very back rows of the East Upper and the upper corners of the West Stand were full of spectators. Of course, the three thousand away fans were in early and were making the expected din. I suspect that they had been on the Carlsberg all day. Alan had met a couple in The Imperial and he reported that they were buzzing. Their balcony was covered in club banners and flags. Throughout the game, they did themselves proud. Lots of noise. Balloons when the two teams entered the pitch. Lots of planned and choreographed waving of scarves and bizarre hand-jives…lots of singing, lots of fun. It was back to the CL style programme – white cover, spine – for this game. The programme seller gave me an extra one and I noted a photo of Gill and Graeme inside. Carlo was testing the 4-4-2 once more and I was a little surprised to see Fernando Torres on the bench. We couldn’t hit a cow’s arse with a banjo. We couldn’t hit a donkey’s arse with a saucepan. We couldn’t hit a chef’s arse with a soup ladle. We couldn’t hit a spaceman’s arse with a ukulele. We couldn’t hit a red-headed Bourbon Street floozie’s arse with a trombone. We couldn’t hit Peter Piper’s arse with a peck of pickled peppers. We couldn’t hit a banjo’s arse with a cow. The Danes also gave many rousing renditions of the theme from “The Great Escape” too. Generally speaking though, we were subdued and were only roused intermittently. As I looked around to check on the gaps in the seats, I spotted a few more American flags…notably those from Southern California, Austin and the Bay Area. Good work. He had a peculiar running style too, as though his upper body was in a different plane to his legs. His arms tended to move sideways. We carved out plenty of chances in the game, of course…a few early chances including one for Yuri with the entire goal begging, a Drogba curler which was well saved, a great deep cross from Bosingwa which was volleyed wide by Didier, a couple of Anelka one-on-ones wasted, a Ramires strike saved, some head tennis in the six yard box and a Mikel header hitting the bar, a strong run from the substitute Torres and a deft flick, a deflected Torres shot and an Essien blast saved. The pick of the bunch though, was a nonchalant shot from Didier which ballooned about fifteen yards in the air and went off for a throw-in down below the TV studio in the NE corner. Overall, I thought Drogba and Anelka played two far apart, especially in the first-half. They need to work on their partnership and that can’t be done when they are so distant. The midfield did not really support the front two that well…I have the impression that Carlo advised the team to play within themselves and not overly exert themselves. I can see the reasons for that. Despite the 25 shots on goal, the mood was of frustration amongst the Chelsea faithful, though. Torres looked sharp…I keep saying it…the goals will come. Copenhagen didn’t really threaten too much, but of course the free-kick which rattled our woodwork certainly gave us a scare early on. As I left the stadium, there were murmurs of discontent, but it only took me a few sobering moments to remember March 16th. 2010 and I was just glad that had made it into the final eight. Carlo’s pragmatism over wild adventure had succeeded and we all eagerly await the draw on Friday. On the drive home, I contemplated the draw options while listening to a few Spurs fans on “606.” They were just too full of themselves and I’m just dreading our two names to be drawn together in the quarters. Looking ahead, I am hoping to travel to any venue apart from Donetsk. I have visited all of the other six stadia over the years, though I haven’t seen a game at Real Madrid. As I missed out on the trip to the San Siro in 1999 and 2010, a game against Inter would be my personal favourite, though a return trip to the grimy industrial town of Gelsenkirchen would not be a problem either. On Sunday, let’s beat City.